It is widely known that PowerPoint provides us with a lot of convenience in commercial advertisement, training and teaching process as well as many other areas which are in need of presentations. However, PowerPoint needs a computer and a projector to present for others. If there is no such equipment, we are not able to share it with others. Besides, in order to keep the source presentations from being modified by others, it is necessary for us to convert PowerPoint files to DVD so as to keep it safe and play it in DVD players and on TV. Then the problems on how to create DVD from PowerPoint will emerge. Luckily, there are some helpful solutions to DVD from PowerPoint that can give you a hand. Known as a professional and powerful PowerPoint to DVD converter, Leawo PowerPoint to DVD Pro can effectively provide a comprehensive and easy-to-use solution for all kinds of users who need to convert PowerPoint to DVD/Blu-ray disc or convert PowerPoint to folder or ISO file. The multiple features can even allow you to burn PowerPoint to video with background music.You can follow the simple guide here to turn DVD from PowerPoint as soon as you download this application on your PC and install it. After you start this application, you enter the main interface and then click “Import” button in the menu bar to add source PowerPoint Files to the program. Here you are able to add 12 files altogether at once and finish the playback options setting as being shown in the picture below. Step 2: Set Output Options. Click “Options” in the menu bar and then you can choose “Create Standard DVD” as the an output option. Then you can set output Format and Folder in this panel. Make sure that you choose the right Blu-ray DVD options. Or you can click “Help” for setting assistance from Leawo if you don’t know it exactly. 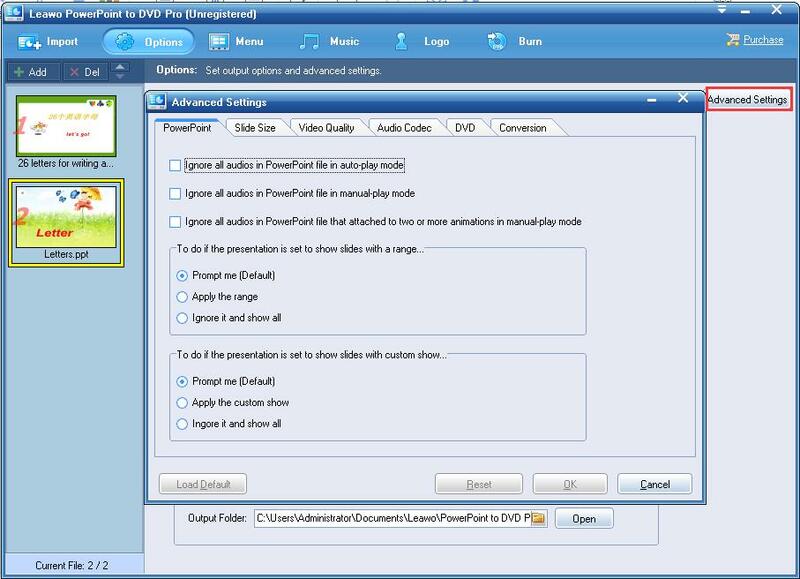 Here is offered “Advanced Settings”, which enables you to customize the DVD slideshow so that you can adjust audio status in your PowerPoint file, size of slides, video quality, audio codec, Blu-ray/DVD language code, Blu-ray/DVD menu parameters, and conversion status. Step 3: Create Menu for the Output DVD. Click “Menu” tab to enter the panel where you can choose a preset DVD menu template or create a particular theme on your own. There are some great menu templates alternatives. And you can also create your own by clicking “DVD Menu Creator” to enter the DVD Menu creator interface for customization. As soon as you click “Music”, you can enter the panel to add audio files as background music for your DVD slideshow. Then choose the mode you need and set the delay timing and choose loop play. Auto mode: 5 audio files can be added in sequence for one object. Manual mode: As soon as you click “Music”, you can enter the panOne audio file can be added to each single slide of a PPT file separately. Click “Logo” to add a watermark to output DVD. Here you can add a logo to the DVD, such as your company trademark, your favorite picture and so on. 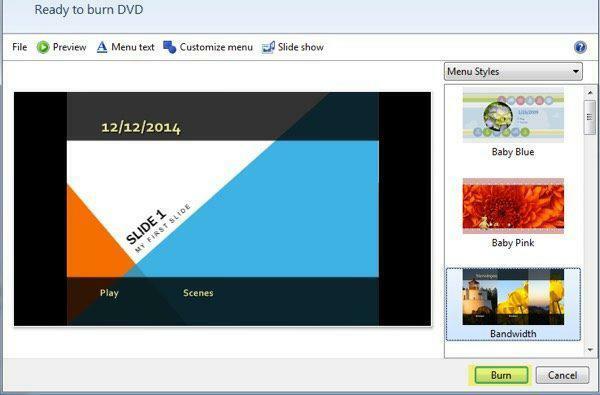 Click “Burn” and insert a blank DVD to your PC, and then click “Start” to convert your presentations to DVD. Obviously, working as PowerPoint to DVD burner, Leawo PPT to DVD Pro. could make and burn DVD from PowerPoint effectively with easy steps. Apart from burning DVD from PowerPoint, it is also able to convert PPT to video and audio in over 180 formats, keep all elements from PowerPoint to DVD, Blu-ray Disc and video and provide 2 flexible chapter schemes: One Slide One Chapter and One Animation One Chapter. Anyhow, this tool does do a great favor for your DVD from PowerPoint conversion. 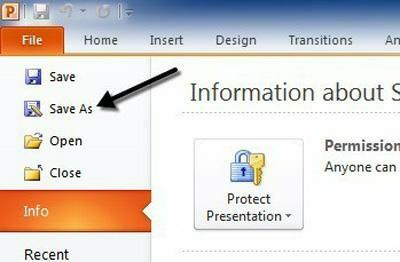 Of course, there are also other applications that can help you make DVD from PowerPoint. And you’d better know something about it. Except for Leawo PPT to DVD Pro., there is also some useful freeware for making DVD from PowerPoint. You can know about the free solutions and choose the proper one to get your DVD from PowerPoint as effective as possible. 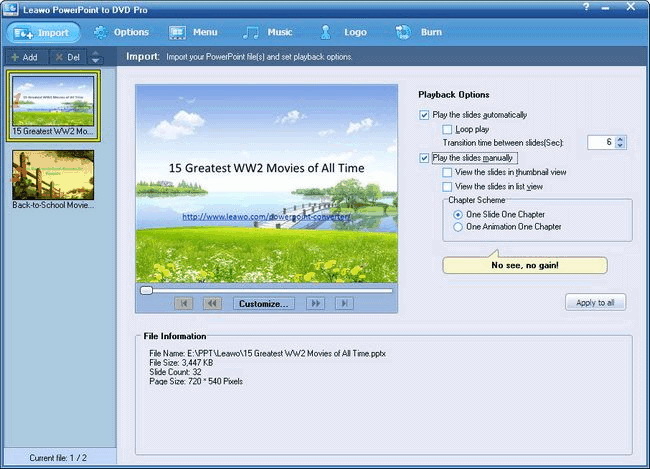 Windows DVD Maker is one of the most commonly used tools to burn DVD from PowerPoint. It has been introduced with Windows Vista, and now it is also included in Windows 7 Home Premium and Windows 7 Ultimate. It supports the common video formats like AVI, MPV2, WMV, etc., audio formats like MP3, WAV, WMA, etc., and picture formats like BMP, GIF, JPG, PNG and so on. However, Windows DVD Maker supports writing on DVD but not on Blu-Ray Disc. You can follow 3 simple steps to make DVD from PowerPoint. Open the source PowerPoint file, click “File” to select “Save as”, and then choose “Video Format” as the file type. Step 2: Launch the Tool and Add source PowerPoint. 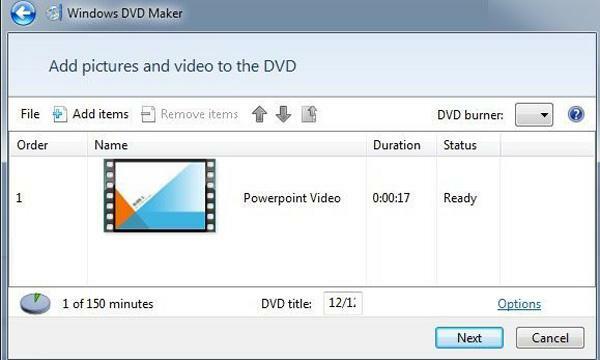 Launch Windows DVD Maker to enter the main interface, click “Add items” on the top menu to add the PowerPoint video. Or you can simply drag or drop the video file to the interface. You insert a blank writable DVD to your PC, clicking “Preview” to set a proper menu. Click “Burn” to start making DVD from PowerPoint. 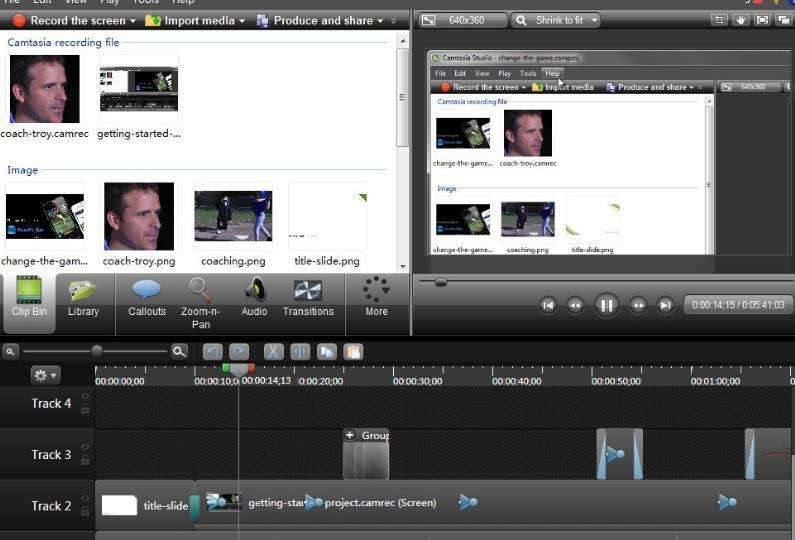 Camtasia Studio is designed for easy screen recording and video editing software. You can transform PowerPoint presentations to a compelling video, and then add videos and narrations to slides. And you can record, convert, and deliver PowerPoint in multiple formats including Flash, Windows Media and so on. Then you can turn it into a DVD-ready AVI file which can be played back on TV and computer. To sum up, there list three types of solutions for making DVD from PowerPoint. You will find the best solution that will help you. Feel free to make it and you will be an expert then.